Attorney Edgardo Barreto urged the group of about 50 nonprofit sector representatives present at the forum to seek legal advice. The reorganization process of Puerto Rico’s public finances has a direct impact on local nonprofit organizations, especially those to which the government owed money at the time the petition was filed in court earlier this month, according to members of the “Movimiento Una Sola Voz” and the Foundations Network. The government of Puerto Rico filed a petition to restructure its $70 billion public debt under Article III of the Puerto Rico Oversight, Management and Economic Sustainability Act, which was approved by the Fiscal Oversight Board and has already been assigned to federal Judge Laura Taylor-Swain. The first hearing is May 17. 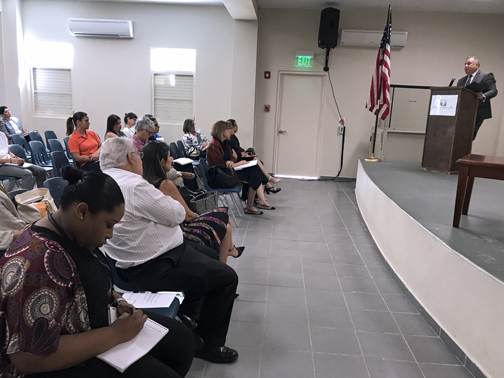 The concerns arose during a forum entitled “The impact of the bankruptcy declaration by the government of Puerto Rico under Article III of PROMESA on nonprofit organizations.” It was then when Díaz-Cotto, who heads the Centros Sor Isolina Ferré, said the sector needs to establish “concrete strategies” to face the island’s new reality. Gerardo A. Carlo-Artieri, an attorney and former federal judge specializing in bankruptcy proceedings, predicted that because theirs are unsecured debts, nonprofit entities will be able to recover “very little, maybe no more than 10 percent” of the money that the government owed them at the time of the filing on May 3. The expert referred to the order of priorities established to pay creditors in bankruptcy cases, which is usually headed by secured debt and what is owed to lenders who decide to extend credit to the government after the debt restructuring gets going in court. Meanwhile, Attorney Edgardo Barreto urged the group of about 50 nonprofit sector representatives present at the forum to seek legal advice to ensure that accumulated debts up to the bankruptcy filing are included in the list of creditors certified by the federal Court. “In addition, entities that want to continue to establish alliances with the government to offer different services must ensure that the contracts signed from now on have the necessary safeguards to have greater certainty of payment for the services to be rendered,” Barreto said. Hey Buddy!, I found this information for you: "Nonprofits ‘worried’ about bankruptcy under PROMESA". Here is the website link: https://newsismybusiness.com/nonprofits-worried-bankruptcy/. Thank you.